The races over the weekend of the 9th & 10th March were held with permission of the Crown Estate in Swinley Forest, near Bagshot. We raced this course just before the European Championships last year but didn’t get time to blog about them, so thought I would take the opportunity now. The parking at the venue is just off the side road into the forest in a hard packed clearing and both the start and finish chutes are just off this area. We arrived in the dark after having an awful journey with a caravan tyre blow out and huge delays on the M4 but setting up was easy and we’d soon forgotten about the problems we’d encountered – there’s something very soothing about being camped up in a forest! The weather had been dry for a while until a few days before the races and so I wasn’t quite expecting the course to be as muddy and challenging as it turned out to be. The start of the course was down a straight, hard packed track which only slightly curved around through the trees but then you carried straight on, off the track through the first really deep muddy, rutted section, followed by a sharp left hand turn onto a wide sandy track. The track got progressively muddier and I had to get off and jog next to the bike near the top of a small uphill before a sharp right hand turn into some single track through the trees. The single track section was also fairly muddy and had lots of tree stumps and roots to negotiate, there were a few near misses in this section and I believe one canicrosser fell after sliding on one of the wet tree roots. 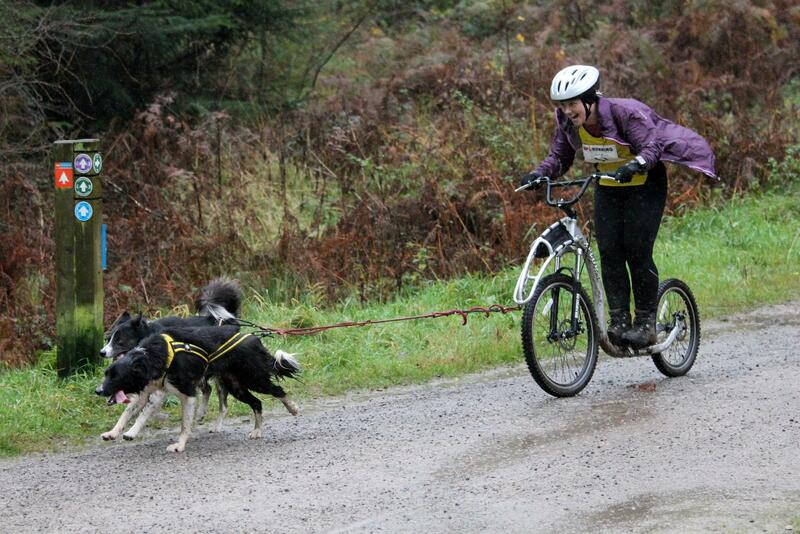 When we completed this course in September it was much drier and quicker to ride. I really noticed the difference in the going and in spite of some changes to the course to avoid the worst of it, the rutted ground and sections filled with mud and water were testing. After the single track section, a right turn down hill, then another sharp left took you on a little detour through some more tracks, before turning right again twice to join back up with the old course. The tracks in this part of the forest were grassy, undulating and brought you around onto the hard packed trails again. This time the ruts were very deep and at one point there was even water flowing across the track in one of the ditches that seem to have appeared since September. We had been warned in the race briefing to avoid the centre of the track at this point and the right hand side provided a shallow option, easier on the bikes wheels and runners feet! 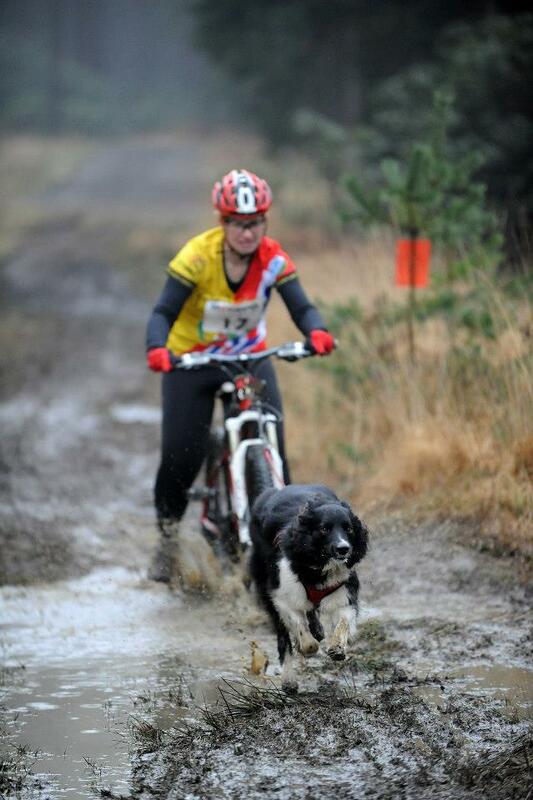 The final dog leg (!) brought you into the finish chute which although slightly uphill was welcome relief in terms of ground as it was rut, water and mud free. We completed the races on both days, managing not to fall off and Judo and I even claiming a 3rd place for our efforts, so I was very pleased. I think the Buttersteep races, although relatively flat with few hills, were still quite tricky, both for bikejorers and canicrossers, as the conditions made the course tough and a good test of knowing when to take it easy so as not to lose valuable time falling over! 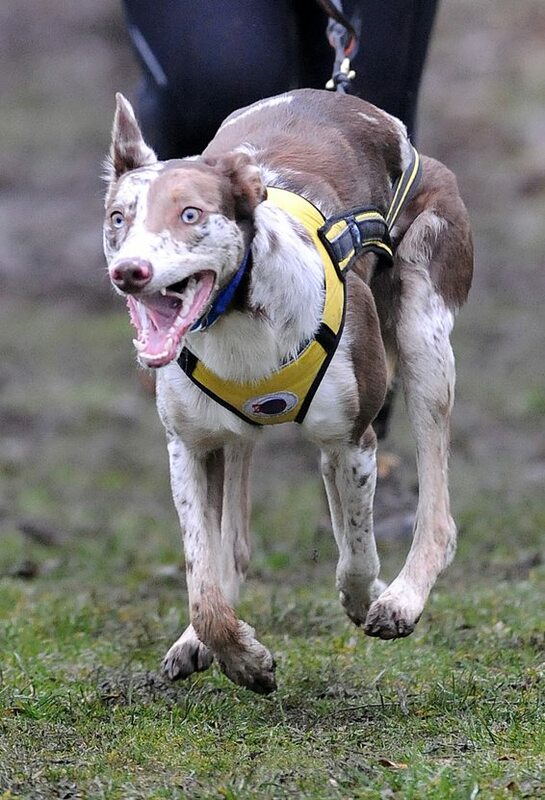 It is manufactured in the Czech Republic by people who also compete with their dog teams in a variety of winter and summer dog sports and therefore understand the needs of a performance sports dog harness. The harnesses are made from water repellent, quick drying material with integrated hi-viz reflector strips on all sides for safety in low light conditions and if set-up correctly, the line angle for canicross, bikejor, skijoring, dry land mushing, sledding and scootering does not matter as with other harnesses, as it designed to work effectively with any line height. The design of the Euro Long is unique and also protected by an International patent to ensure the design stays true to it’s original form. The harness distributes all pulling force evenly around the ‘yoke’ which sits around the neck of the dog, on the shoulders, but does not rise into the throat area and actually directs the force away from the neck, underneath the dog and along the side straps. The unique design of the harness leaves the back unrestricted for a full range of movement. 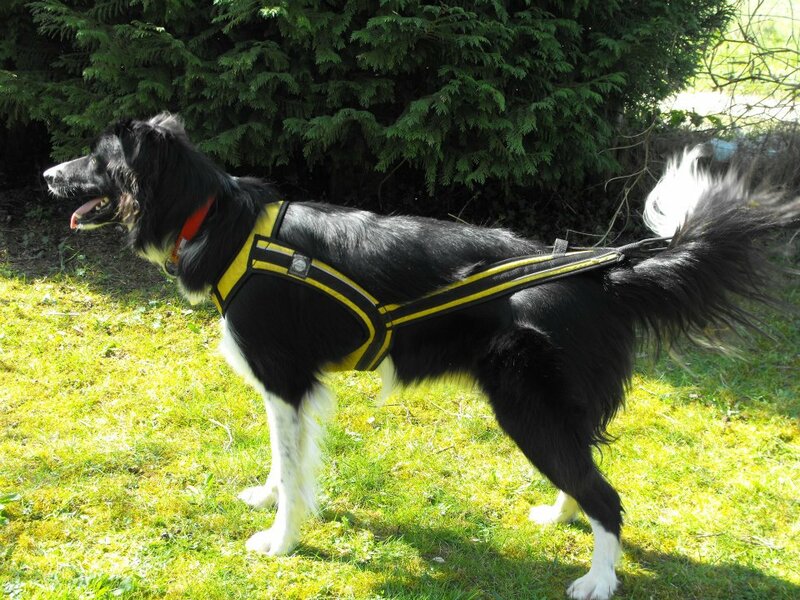 The wide side straps of the harness lie alongside the dogs’ body providing lateral support, preventing the harness from twisting or slipping but without restricting lung capacity when pulled tight. The open back design of the Euro Long does not inhibit the dogs’ spine movement and in our opinion works particularly well in dogs who ‘bound’ along when they run. The harness is designed to suit hound type dogs but works equally well with other sled dog breeds and with almost any dog breed, as it can be custom made if a size cannot be selected from the standard sizes. We recommend this harness for strong pulling dogs as it works best when the dog keeps a constant tension on the line. 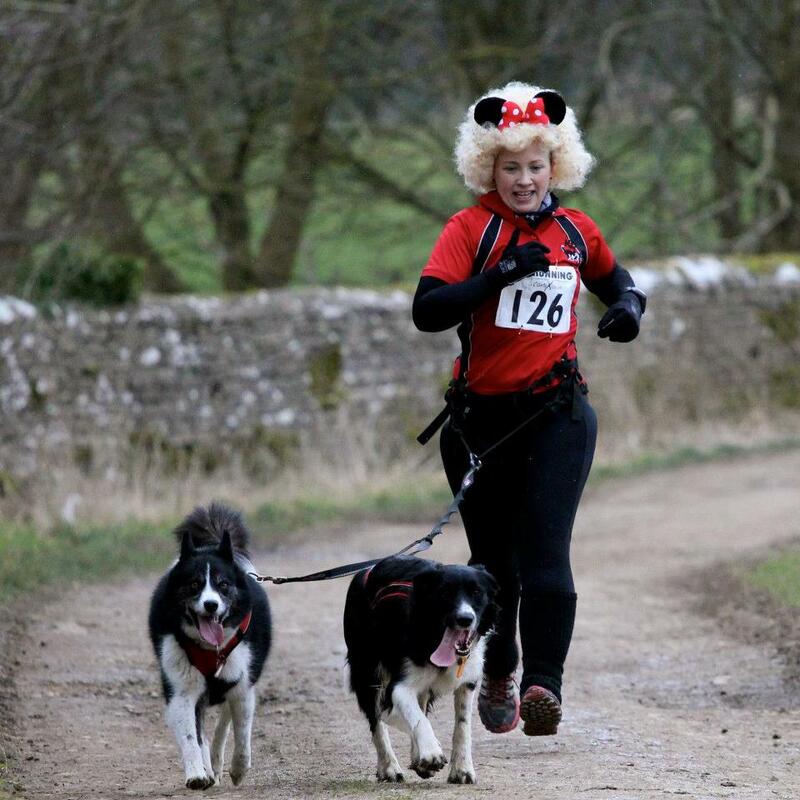 The Sherbourne CaniX races held over the weekend of the 23rd & 24th February were again very close to K9 Trail Time HQ and the course was set in the beautiful Sherbourne Estate on National Trust land. We arrived early Saturday morning in the freezing cold minus temperatures to be directed into a big fenced field for parking. 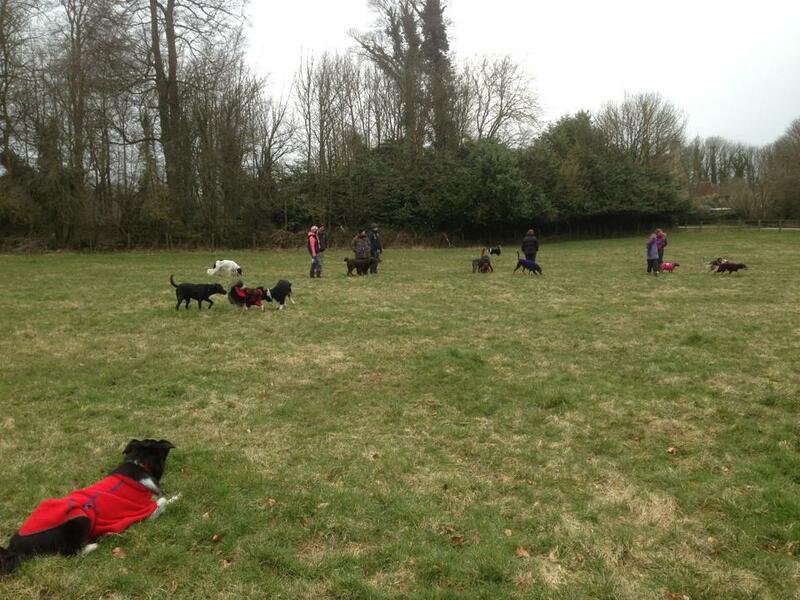 The field was great for letting the dogs off lead together and there aren’t many events where there is such a secure area for this, so it was great to see them all running around before and after the races. The start chute was through a wooded area just outside the camping field down the estate track and took you alongside the roads that brought you to the venue. I hardly noticed the roads, as the woods were thick enough to ensure that you felt like you were in a forest, although in reality it was fairly small area of woodland we were running through. The first mile or so was quick, with no hills but the frozen mud made for some tricky surfaces under foot at times. At the end of the woodland, a left turn took you onto a hardpacked farm track and down a hill with open fields on the right hand side. It was a chance to really pick up some speed (if you so wished!) and apart from an uphill in the middle, took you down hill all the way into the village of Sherbourne. A sharp left hand turn through a gate took you back into a wooded area filled with snowdrops which was lovely to run through. A fairly steady uphill led the canicross racers winding through more woodland, with more snowdrops, until a right hand turn took you out onto another farm track and back towards the start. The final run into the finish was thankfully slightly downhill and allowed us to end the 5.8km course with some breath left! I found the course a pleasure to run and even dressed up for Sundays run just for a giggle. 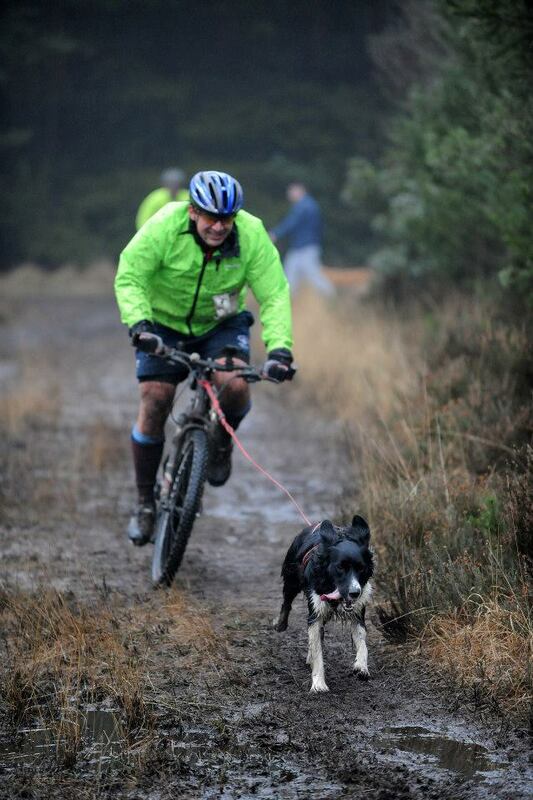 To summarise: a scenic canicross course with some long undulating sections designed to test racing stamina, suitable for beginners and experienced runners alike, I hope this one makes a regular appearance in the racing calender. The back pocket of the Comfort belt holds keys, a phone and even space for poo bags! 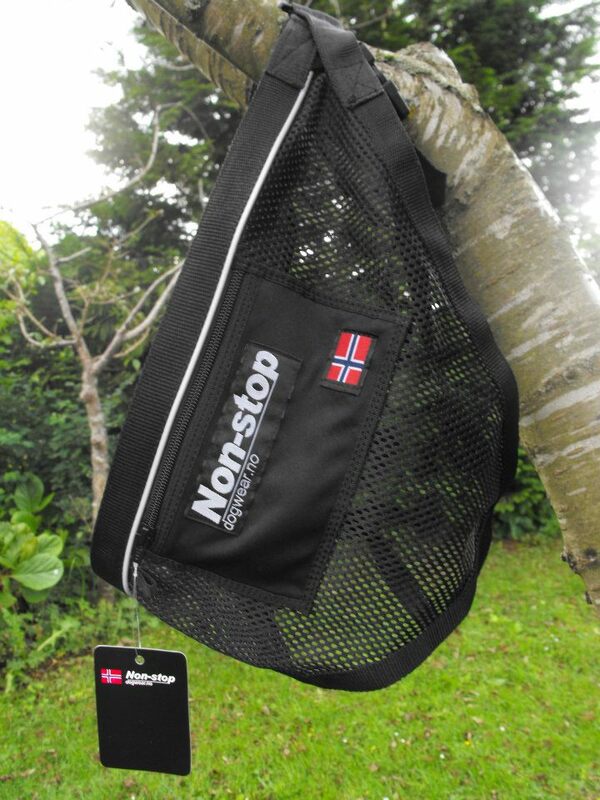 This belt from the Norwegian designers at Non-Stop is what I have referred to in previous posts as a ‘nappy belt’, in that it covers the whole of your behind when fitted correctly and looks somewhat similar to a nappy! The advantage of this is that it disperses the pulling force of the dog across a wider area, therefore putting less strain on your back as it keeps the pulling force below your lower back area. The integral leg straps are crucial to this process and stop the belt riding up where the pull could be directed on your lower back. The dog’s line attaches on a metal hook at the front of the belt and at first I wasn’t keen on this design as the hook sticks out in front of you and would (I imagine) be painful to fall on, if like me, you are prone to the occasional faceplant! However, a good friend pointed out that if you cross the leg straps through the hook, it not only pulls the hook in line with your body (therefore stopping the hook pointing out in front of you) but it also nicely secures your line in place for running and gives a quick release option for moments when you might need to detach your dog quickly. In conclusion, I am now quite a fan of this belt and would recommend it for anyone who needs to keep any pulling force away from their back. 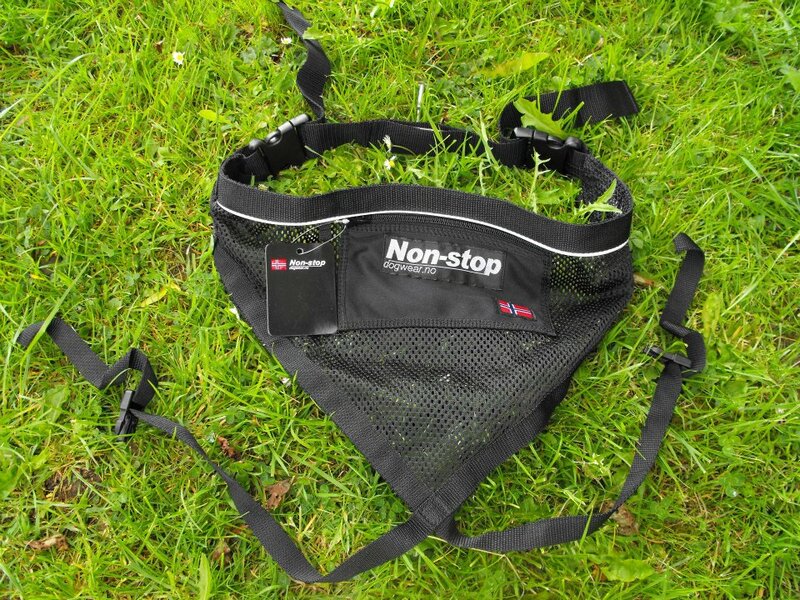 The Non-Stop Comfort belt is extremely lightweight, easy to wash and simple in it’s design, perfect for not only racing but every day use too, with the pocket for storage.